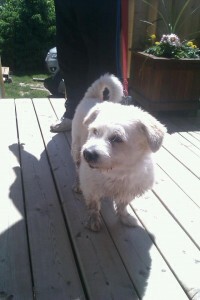 HAPPY ENDING: Safe n' Sound: Found: Roaming Dog: Pine Hill Dr, Elmsdale, Halifax Co., NS — Lhasa Apso/Terrier Mix, Male, Adult — "Unknown"
Additional Notes: MALE: Terrier/Lhasa mix (?) wearing a red collar, no tags. Friendly and good with other dogs. Found May 27/12 – am.